“Take it to the bank, I guarantee it,” she growled. Was this just more inane rambling from a partisan Democrat? Or does Pelosi know something we don’t? The media loves to portray Democratic Congresswoman Pelosi as a softhearted grandmother from California. The former Speaker of the House is positioned as a kindly woman of the people… a champion of the poor and downtrodden. But in truth, she’s a dyed-in-the-wool Deep Stater. Her father, Thomas D’Alesandro, Jr., was a U.S. Congressman from Maryland who served on the immensely powerful Appropriations Committee, the one that controls the government’s purse strings. Remember the young guy in Goodfellas? That’s Pelosi’s early life learning at the feet of Big Tommy. And she used that same ruthlessness and corrupt connections from her father’s political machine to become the highest-ranking female politician in U.S. history. In short, Pelosi is a master political operator whose Deep State connections extend all the way back to her birth. Today, Pelosi remains one of the most influential Democrats in Congress. And one of its wealthiest members, with reported assets north of $200 million. How does a humble servant of the people on a government salary amass such a huge fortune? Pelosi’s made a killing being at the nexus, the dead center, of Deep State deal making. She’s infamous for crooked schemes like directing more than $1 billion in subsidies to benefit a big Democratic donor’s company in which her husband was a major investor. Pelosi knows how to keep the Deep State’s players happy… and her family gets rich for greasing the skids. She also knows how to keep the wheels of the Deep State’s war machine rolling by supporting the surge in Afghanistan, the military “action” in Libya, and advocating our entry into Syria’s mess. Pelosi is an essential cog within the Washington D.C. Deep State apparatus. She twists the power levers to ensure that the insiders prosper off the backs of people like you. And she is damn good at her job. 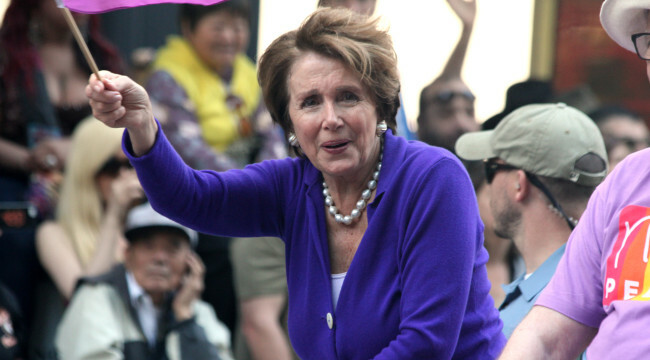 Look, yes, Pelosi might come off as a loon with overdone Botox brain damage. But the truth is she’s a savvy, dangerous operative. She’s a shrewd political animal with proven skills and the required pathology to get what she wants. So when she “guarantees” that Trump won’t become President, people should sit up and take notice… especially Donald. This is another sign that the Deep State will do anything to make sure “Crooked Hillary” is the next President. Mike Lofgren knows all about the dangers of the Deep State and Pelosi’s ilk. I spoke with Mike recently on my podcast. Mike spent 28 years working in Congress, the last 16 as a senior analyst for the House and Senate Budget Committees. He’s seen the inner workings of the Deep State firsthand. And the secrets he reveals are startling. Click here to listen to my conversation with Mike Lofgren. Please send me your comments to coveluncensored@agorafinancial.com. What do you think of the Deep State threat?